Large size provides a wide area of coverage from low mounting heights. Will accommodate all sizes of MH and HPS lamps. 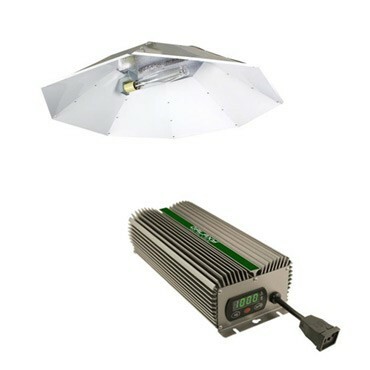 Low mounting height reduces distance to plants and thus increased light levels. Reflector dimensions: 48 in Diameter x 10 in Deep. It operates MH and HPS lamps in the horizontal position but in an eight-sided parabolic shaped reflector. In the horizontal burning position, much of the lamp's light is thrown straight down and the balance of the lamp's light which is emanating upward is re-directed back down to the plant canopy from the 95% reflective German aluminum insert. Pre-wired with lamp cord and adjustable socket. Does not accept BT56 lamps.